The ideal place to practice outdoor sports; clear sand dunes, ancient buildings at Cabo Falso that add a dash of mystery, a great old lighthouse and the deep blue sea. 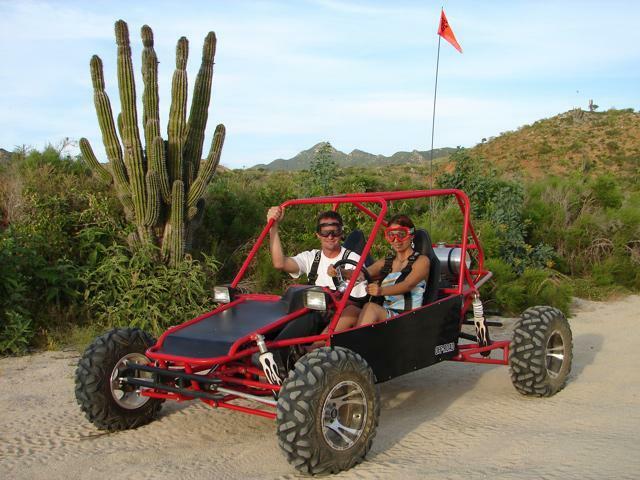 In Cabo San Lucas, you can organize excursions from 1 ½ hours up to 5 hours, where you can enjoy the wonders of the area on a four-wheeler. Generally these adventures are scheduled for 3:00pm, which makes it a good idea to bring light clothing that covers well or a good sun block. A major worldwide tourism development with marinas, golf courses, shopping centers, art galleries. At its stunning beaches you can enjoy all kinds of water activities, and its desert landscapes, adventure sports and ecotourism. Its cuisine and unparalleled crazy nightlife are internationally renowned.